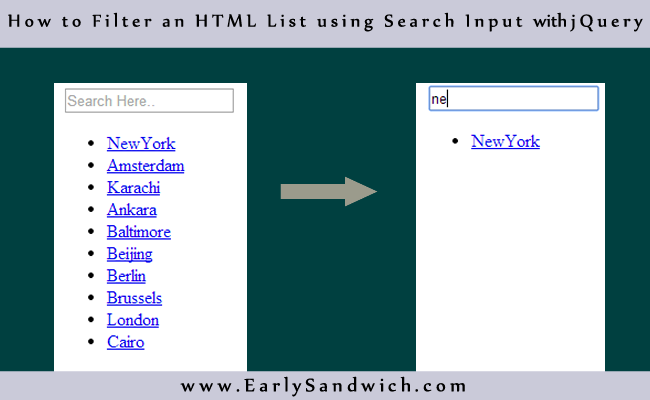 Today I am going to write a tutorial about how to search and filter an HTML UL li list using a search input box. Sometimes we have a big unsorted list and it takes lot of time to find exactly what we want, so we can make it easy for user to just search & filter the list. This all is done using a small jQuery function. Lets move on to the solution. Here is an HTML list of famous cities of the world. So here is a list. Now we can use jQuery to sort this list using an HTML input box. You can create list yourself and list can be as long as you want. This jQuery snippet will do all the searching. This jQuery code will perform a search triggered by a key-up event on famousCities list and will show only items which match with words you entered. Here is the complete working code that will perform the search.